Autophagy, also known as type II programmed cell death, is involved in the development and progression of various diseases. There is a complex interaction between autophagy and apoptosis. For instance, they both can be activated by multiple stressors, share multiple regulatory molecules, and even coordinate with each other. A comprehensive and in-depth study of the interaction mechanism between autophagy and apoptosis will bring about breakthroughs in the cognition and treatment of diseases such as tumors. 1. What are Autophagy and Apoptosis? Autophagy is a conservative way of self-degradation of cells, which is the process of degrading damaged organelles and macromolecules by lysosomes. The basal level of autophagy is necessary to maintain cell homeostasis, while autophagy is involved in anti-aging, differentiation and development, immunity and pathophysiological processes that eliminate diseases such as microorganisms and tumors. According to the way of binding molecules, autophagy is divided into: macroautophagy(here called autophagy), microautophagy and chaperone-mediated autophagy (CMA). Among them, giant autophagy is the most studied. The autophagy discussed in this paper refers to giant autophagy. Apoptosis is the process by which cells actively end their lives and is essential for maintaining cellular homeostasis. Apoptosis can be activated by a variety of cellular signals, including increased intracellular Ca2+ concentration, reactive oxygen species (ROS) such as hydroxyl radicals caused by oxidative damage, toxins, NO, growth factors, and hormonal stimulation. The main signaling pathway of apoptosis is the mitochondrial pathway and the death receptor pathway. Intracellular apoptosis signals usually activate the mitochondrial pathway, stimulate the activation of BH3-only protein to bind to apoptotic proteins such as Bcl-2, activate Bax/Bak aggregation to the mitochondrial membrane, and release mitochondrial pro-apoptotic proteins including cytochrome C, SMAC/DIABLO. And apoptosis-inducing factor (AIF), etc., activate the caspase cascade and induce apoptosis. Cell death can be divided into two types, apoptosis and necrosis. Apoptosis, the first genetically programmed death process identified, is a cellintrinsic mechanism for suicide that is regulated by a variety of cellular signaling pathways. Acturally, apoptosis does not determine a cell’s fate alone. Autophagy, also known as type II programmed cell death, a process in which denovo-formed membrane-enclosed vesicles engulf and consume cellular components, has been shown to engage in a complex interplay with apoptosis. On one hand, it can serve as a cell survival pathway by suppressing apoptosis, for example, the removal of damaged organelles that are a source of genotoxic ROS, or by catabolizing cellular macromolecules to provide a source of nutrients and energy for the starved cell, or by limiting ER stress through the degradation of unfolded protein aggregates. On another hand, it can lead to death itself, either in collaboration with apoptosis or as a back-up mechanism when the former is defective. There are three different types of interaction between autophagy and apoptosis. Among of them, the first one type is to induce cell death in a coordinated or cooperative manner as partners; the second one is that autophagy acts as an antagonist to block apoptotic cell death by promoting cell survival; the third one is that autophagy acts as enabler of apoptosis, participating in certain morphologic and cellular events that occur during apoptotic cell death, without leading to death in itself. Numerous researches have been reported that the mode of cooperation between autophagy and apoptosis. In this case, both autophagy and apoptosis are regulated to promote cell death. There are three types of cooperation: (1) each of them triggers cell death synchronously; (2) one is dominant and the other is supplemented; (3) under circumstance of one functional defect, the other substitutes to induce cell death. Many apoptosis-inducing stimuli often induce autophagy, for instance, both apoptosis and autophagy are simultaneously upregulated by treatment in breast cancer cells with ceramide . In the clinical trial of arsenic trioxide treatment of T lymphocytes, it was also found that both were activated simultaneously , and the antibacterial drug chloroiodoquinoline induced autophagic death and apoptosis in leukemia cells and myeloma cells by disrupting the mTOR signaling pathway. Specific knockout of the autophagy-associated protein ATG7 or autophagy inhibitor 3-methyladenine inhibits caspase activation and reduces apoptosis; in many cases, the potential for autophagy-induced cell death is apoptotic Inhibition, but it plays a key role in the defect of apoptotic function. Treated Bax-/-/Bak-/- mouse embryonic fibroblasts cells with etoposide and toxic carrot lactone up-regulated cell autophagy . In these cases, autophagy and apoptosis together trigger cell death through a synergistic, complementary, or alternative mechanism. In the confrontational relationship, autophagy runs counter to the goals and processes of apoptosis. Autophagy does not trigger cell death, but instead promotes cell survival. In endoplasmic reticulum stress, autophagy maintains endoplasmic reticulum function by digesting protein aggregates and misfolded proteins, limiting apoptosis induced by endoplasmic reticulum stress. In the cellular energy crisis, autophagy also provides energy and nutrients to cells through the digestion of large molecules such as organelles and proteins, prolonging cell life. Thus, autophagy is required for cell survival in the starvation phase of adult mice, the feeding adaptation period after sucking rats, and the nutrient-deprived cells . Autophagy is also an important mechanism for maintaining gene integrity when cells are exposed to metabolic stress, drug therapy, and radiation damage. Therefore, inhibition of autophagy in breast cancer, prostate cancer and colon cancer cells can increase the sensitivity of tumor cells to radiotherapy and chemotherapy . Mitochondrial autophagy is a kind of autophagy, which can reduce the reactive oxygen species by eliminating depolarized mitochondria and achieve the purpose of cell protection. Mitochondrial autophagy can even prevent apoptosis by reducing mitochondrial outer membrane permeabilization (MOMP) and reducing the release of mitochondrial pro-apoptotic proteins such as cytochrome C and SMAC/DIABLO . Promoting autophagy in the relationship is not directly involved in inducing cell death, but as an energy provider to ensure that apoptosis proceeds smoothly. For example, in the case of nutrient deficiency, cells maintain intracellular ATP levels by up-regulating autophagy, allowing intracellular phosphatidylserine to release apoptosis signals to extracellular exposure . The membrane vesicle formation process of apoptotic bodies is dependent on ATP-driven actomyosin contraction. If inhibition of autophagy prevents these ATP-dependent apoptotic features, it has no effect on other apoptotic responses . 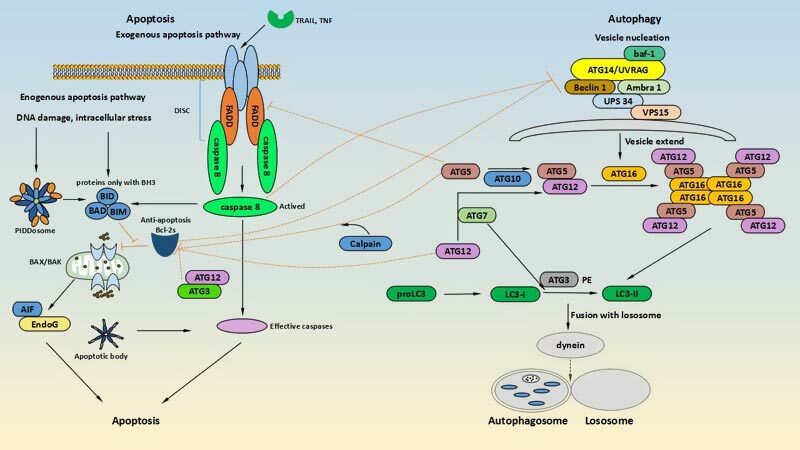 The multiple interactions between apoptosis and autophagy must have a common signaling pathway and regulatory proteins, which researchers call interaction regulators. This article focuses on the dual regulation of caspase, Melatonin and endoplasmic, ATG, Bcl-2 family proteins and Interferon regulator 1. Apoptosis-related caspase family proteins can interact with autophagy-related proteins. Caspase-3 inhibits autophagy and promotes apoptosis by inactivating Beclin-1 by cleavage . In T cell studies, it was found that caspase-8 regulates autophagy, and the autophagy is up-regulated in caspase-8-deficient T cells or Fas-associated death domain (FADD) related proteins deficiency T cells . Giulia Allavena et al. Have found that targeting translational machinery can be beneficial to elimination of autophagy-deficient cells via the CASP8-dependent apoptotic pathway. Futhermore, under stress conditions, a sizeable of evidence suggests that one of the main mechanisms for activation of apoptosis in autophagy-deficient cells is accumulation of damaged mitochondria that triggers apoptosis by the CASP9/caspase-9-dependent pathway. Furuya et al. found that Beclin-1 can enhance apoptosis-induced apoptosis by increasing caspase-9 activity. ATG genes are not exclusively involved in autophagy but are also implicated in various other important cellular processes, including endocytosis and protein secretion. Autophagosome formation is dependent on the covalent attachment to a series of ATG proteins in protein ubiquitination. ATG5 and ATG12, also known as the "core" of autophagy, are essential to autophagosome formation. Furthermore, they are also found to be involved in the regulation of apoptosis. Yousefi, S. et al. have revealed that overexpression of ATG5 can induce autophagy and enhance the susceptibility of tumour cells to activate the intrinsic celldeath pathway. under the condition of lethal stress, the full-length ATG5 can be cleaved by Caplains to remove the C termius, generating a 24-kDa fragment. The autophagy-inducing activity of this fragment is instead of pro-apoptotic activity. the ATG5 fragment translocates to the mitochondria in an unknown mechanism and binds to the anti-apoptotic protein Bcl-xL, then promotes mitochondrial cytochrome C release and inducing apoptosis . In addition, The study of Ding found that ATG12 is not only required for caspase activation under a series of different apoptotic stimuli, but also neutralizes the anti-apoptotic ability of Bcl-2 and Mcl-1 by binding. Further experiments revealed that ATG12 has a pro-apoptotic function due to its BH3-like domain that binds to Bcl-2 and Mcl-1 . Bcl-2 family proteins play a key dual regulatory role in apoptosis and autophagy, including three subclasses: the pro-apoptotic proteins Bax and Bak sharing BH1-BH3 domain; the anti-apoptotic proteins Bcl-2, Bcl-xL, and Mcl-1 sharing BH1-BH3 domain; The pro-apoptotic proteins of the BH3 domain, Bad, Noxa, BNIP3, etc. . Degradation of the anti-apoptotic protein Mcl-1 was found in an early stage of autophagy activation. BCL2 and its homologues are likely to inhibit autophagy by binding directly to beclin-1, because beclin-1 mutations that abolish its interaction with BCL2 or BCL-XL confer a gain-of-function phenotype with respect to Beclin-1 mediated autophagy and abrogate its inhibition by BCL2 or BCL-XL. When Beclin-1 binds to BcL-2/Bcl-xL to form Beclin-1-Bcl-2/Bcl-xL complex, it can inhibit Beclin-1 to active autophagy. However, when BcL-2 pro-apoptotic protein competitively binds to Bcl-2/Bcl-xL, Beclin-1 is released to induce autophagy. Another Beclin-1-dependent regulated mechanism inhibits autophagy via caspase-3 cleavage of Beclin-1. The latest Lindqvist et al. determine that the anti-apoptotic proteins Bcl-2, Bcl-xL, and Mcl-1 do not directly affect autophagy, but indirectly through inhibition of Bax and Bak. ER stress not only induces the apoptosis via the intrinsic pathway, but also speciffically affects ER as a particularly effcient stimulus of autophagy. ER stress is a major stimulator of an autophagic response that participates in the degradation of unfolded proteins and in the removal of superfluous ER membranes, and is usually caused by the accumulation of incorrectly folded proteins in the ER lumen, giving rise to the unfolded protein response (UPR). The three main transducers of the UPR in multicellular organisms are sensing the presence of unfolded proteins in the ER lumen and transduce signals to the nucleus or cytosol, including inositol-requiring protein-1 (IRE1), protein kinase RnA (PKR)-like ER kinase (PERK) and activating transcription factor-6 (ATF6). Emerging evidence suggests that the inhibition of autophagy, induced by ER stress(for instance, with 3-methyladenine, BECN1 or LC3 knockdown and ATG5 knockout), can increase apoptosis. #1 Hamzawy M, Gouda SAA, et al. demonstrate that 22-oxacalcitriol could prevent acute kidney injury via inhibition of apoptosis and enhancement of autophagy. Please click here to view the article. #2 Ozfiliz-Kilbas P1, Sarikaya B, et al. Reveal that roscovitine and purvalanol could induce apoptosis and autophagy related to unfolded protein response in HeLa cervical cancer cells as Cyclin-dependent kinase inhibitors. Please click here to view the article. #3 Hsiao YT1, Kuo CL, et al. Suggest that Curcuminoids could induce reactive oxygen species and autophagy to Enhance apoptosis in Human oral cancer cells. Please click here to view the article. Aimee L Edinger and Craig B Thompson. Death by design: apoptosis, necrosis and autophagy[J]. Current Opinion in Cell Biology. 2004, 16:663-669. A Eisenberg-Lerner1, S Bialik1, et al. Life and death partners: apoptosis, autophagy and the cross-talk between them[J]. Cell Death and Differentiation. 2009, 16, 966-975. Pattingre S, Bauvy C, et al. Role of JNK1-dependent Bcl-2 phosphorylation inceramide-induced macroautophagy[J]. J Biol Chem. 2009, 284: 2719-2728. Qian W, Liu J, et al. Arsenictrioxide induces not only apoptosis but also autophagic cell death inleukemia cell lines via up-regulation of Beclin-1[j]. Leuk Res. 2007,31:329-339. Cao B, Li J, et al. Clioquinolinduces pro-death autophagy in leukemia and myeloma cells bydisrupting the mTOR signaling pathway[J]. Sci Rep. 2014, 4: 5749. Yu L, Alva A, et al. Regulationof an ATG7 beclin 1 program of autophagic cell death by caspase-8[J]. Science. 2004, 304: 1500-1502. Shimizu S, Kanaseki T, et al. Role of Bcl-2 family proteins in a non-apoptotic programmed cell deathdepenedent on autophagy genes[J]. Nat Cell Biol. 2004, 6: 1221-1228. Kuma A, Hatano M, et al. Therole of autophagy during the early neonatal starvation period[J]. Nature. 2004, 432: 1032-1036. Guo JY, Xia B, et al. Autophagy-mediatedtumor promotion[J]. Cell. 2013, 155: 1216-1219. Saita S, Shirane M, etal. Selective escape of proteins from the mitochondria during mitophagy[J]. Nat Commun. 2013, 4: 1410. Ito H, Daido S, et al.Radiation-induced autophagy is associated with LC3 and its inhibitionsensitizes malignant glioma cells[J]. Int J Oncol. 2005, 26: 1401-1410. Inbal B, Bialik S, et al. BDAP kinase and DRP-1 mediate membrane blebbing and theformation of autophagic vesicles during programmed cell death[J]. JCell Biol. 2002, 157: 455-468. Fu LL, Cheng Y, Liu B. Beclin-1:autophagic regulator and therapeutic target in cancer. Int J BiochemCell Biol, 2013, 45: 921-924. Bell BD, Leverrier S, Weist BM, et al.FADD and caspase-8 control the outcome of autophagic signaling inproliferating T cells. Proc Natl Acad Sci, 2008, 105:16677-16682. Giulia Allavena, Francesca Cuomo, et al. Suppressed translation as a mechanism of initiation of CASP8 (caspase 8)-dependent apoptosis in autophagy-deficient NSCLC cells under nutrient limitation[J]. Autophagy. 2018 14(2):252-268. Youle RJ, Narendra DP. Mechanisms of mitophagy. Nat Rev Mol Cell Biol 2011; 12:9-14. Furuya D, Tsuji N, Yagihashi A, et al.Beclin-1 augmented cis diamminedichloroplatinum induced apoptosisvia enhancing caspase 9 activity. Exp Cell Res, 2005, 307: 26-40. Shravage, B. V., et al. Atg6 is required for multiple vesicle trafficking pathways and hematopoiesis in Drosophila[J]. Development. 2013, 140, 1321-1329. Yousefi, S, Perozzo, R, et al. Calpain-mediated cleavage of Atg5 switches autophagy to apoptosis[J]. Nat Cell Biol. 2006, 8: 1124-1132. Rubinstein AD, Eisenstein M, et al. The autophagy protein Atg12 associates with antiapoptotic Bcl-2family members to promote mitochondrial apoptosis[J]. Mol Cell. 2011, 44:698-709. Maiuri, M. C. et al. Functional and physical interaction between Bcl-X L and a BH3-like domain in Beclin-1[J]. EMBO J. 2007, 26, 2527–2539. Lindqvist LM, Heinlein M, et al. Prosurvival Bcl-2 family members affect autophagy only indirectly,byinhibiting Bax and Bak[J]. Proc Natl Acad Sci USA. 2014, 111: 8512-8517. Xu, C., Bailly-Maitre, et al. Endoplasmic reticulum stress: cell life and death decisions[J]. J. Clin. Invest. 2005, 115, 2656-2664. Ogata, M. et al. Autophagy is activated for cell survival after endoplasmic reticulum stress[J]. Mol. Cell Biol. 2006, 26, 9220-9231. M. Chiara Maiuri, Einat Zalckvar, et al. Self-eating and self-killing: crosstalk between autophagy and apoptosis[J]. molecular cell biology. 2007, 8, 741-752. Ding, W. X. et al. Differential effects of endoplasmic reticulum stress-induced autophagy on cell survival[J]. J. Biol. Chem. 2006.